In an age where the technology is increasingly gaining the power to transform the digital world at a frightening pace, all that organizations worldwide have is to study the latest trends and stay abreast of the rapid market changes. By understanding and acknowledging the current and future trends in their strategic plans, business leaders are given the margin to make necessary adjustments in their operational procedures and business models. While failing to stay tuned with such trends put enterprises at huge risk of losing their competitive advantage over their rivals as well as capturing the mighty opportunities in different markets. The 2017 Tech Trends Report published by Future Today Institute is quite full of detailed information, which needs more than ample time to understand everything within. 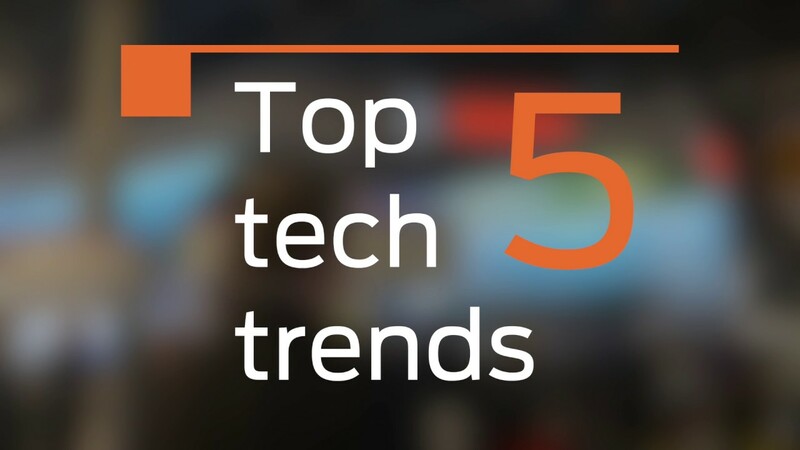 As for this blog post, we are going to highlight the 5 important technology trends that are highly expected to go strong through 2017 and beyond. Artificial intelligence has gone past the stage of infancy or just a mere concept, and is now residing in the phase that has become a key element in almost all the trends outlined in this content. Regardless of the industry, it is vitally important for business owners to get well-aware with the employment of AI. At a gradual pace, AI is starting to acquire its place into most of the major operations of organizations across the globe. The scope of AI is much beyond our imagination and has a long stream of benefits stored for different industries. Consider the example of Deep-Neural Networks, this comparatively new direction of machine learning is soon destined to become a hidden part of every organization. Programmers can now use deep learning algorithms summed with terabytes of different data such as text, videos, images, speech, etc. The point is to empower the systems into learning independently.In other words, this calls for automating a plethora of human processes at the hands of intelligent AI-induced programs, for instance, software writing, monitoring cyber security, etc. While another major branch of AI—real-time learning has its own benefits to offer. You can now seamlessly acquire a continuous flow of transactional data and make required alterations in models in real time. The website behavior could be revamped, the user will be navigated to the exact product based on his/her behavior and custom preferences. Over the course of last year, we have witnessed the hatching of bots and becoming a part of mainstream business processes. Around 12,000 and above Facebook Messenger bots, and different kinds of platforms are easily evident of the increased adoption of the technology by all the big shots globally. Several established brands are affirming the influence of bots in customer service and marketing communications. Take KLM for example, the royal Dutch airlines have incorporated bots in their operations with the aim to provide boarding passes and status updates to their travelers, along with acknowledging the countless messages they receive over the Facebook Messenger app. The trend isn’t likely to slow down any time soon as more and more brands are opting bots to improve the performance of their customer service and social media conversations. Companies like Autodesk and Bradesco Bank are making the best use out of bots at the moment. They are automating responses to FQAs (frequently asked questions) that customer service professionals typically encounter throughout their workday. This allows the agent to save valuable time for more personalized conversations for customers requiring special attention. This new trend of cognitive computing has evolved from the more traditional anticipatory computing, and is registering as one of the top tech trends for a fifth straight year. IBM Watson is the grand platform that showcases how a powerful cognitive computing can elevate the ability of businesses and humans to understand and solve highly complex problems. The platform has now extended well beyond the initial horizonsand has invaded the healthcare, engineering, law sciences, and other major industries worldwide. Through cognitive computing, the respective industry professionals are fabricating new ways to cure cancers, personalize customer interactions, improve the quality of data discovery, acquire vital customer insights, and formulate new trends that will help companies in obtaining a competitive edge in an already intensified competition. Even after experiencing a decent start this year, the trend is likely to gain additional momentum with upcoming years. Last year,IBM unveiled the launch of Cognitive Horizons Network—a high profile network of schools with the purpose of working jointly for solving elite cognitive problems and promote the technology in a plethora of industries. We are all familiar with the application of big data, while this year and further there is going to be no shortage of vast data sets as organizations are striving hard to streamline the employment of big data, hence a mighty indicator for economic growth. Established companies will tend to acquire more and more analytics tools and specialists to assist in key decision making processes, and government institutions will look forward to deploy big data technology for acquiring finances for different programs. Undoubtedly, the job openings for Chief Data Officer will see increasing demand in both mid-sized and large-scale enterprises. Such professionals will be responsible to master the data initiatives, focus on smart and powerful decisions, and connect well will security and surface intuitions. Agreeably, one of the toughest challenges even experienced companies are continuously facing is hunting the right personnel acquiring the expertise of AI and cognitive-based solutions and mindset. The once-unnoticed and rare positions of data scientists, are set to stand strongly as the most sought-after positions in the market. The trend is likely to cause significant shortage of the data science skills, with some statistics predicting a gap of 50% between the supply and demand. Summing all the above and other trends, it is safe to say that we are going to see a potential boom in the technology trends. This year’s report has marked around 150 glaring trends, while a staggering 85% boost in the 80 trends identified in the last year’s report. As the exploding pace of technology advancements is evident from the current and predicted figures, it is obvious the trend of one technology rooting the ground for the succeeding technology is going to happen more than ever. Ronald Marshall is an accomplished software developer having worked with some of the best tech companies across the globe.Besides his technical expertise, Ronald is also a tech geek blogger and an experienced assignment writer acquiring an established client base in a variety of academic disciplines.